There have only been two large prospective studies looking at the chances of conception in couples in which the female partner is a smoker. The largest study to date included 4104 women who stopped using contraception in order to try to conceive. Howe et al. found a consistent trend of decreasing fertility with an increase in the number of cigarettes smoked a day. Eighteen months after stopping contraception, 28% of heavy smokers had not had a baby in comparison to 19% of non-smokers; after 36 months the difference remained, respectively, 14.2% and 7.8%. After 5 years, 11% of smokers and 5% of non-smokers had not delivered. There was a dose-response relationship between the number of cigarettes smoked per day and fertility. Women who were ex-smokers did not show any evidence of decreased fertility. 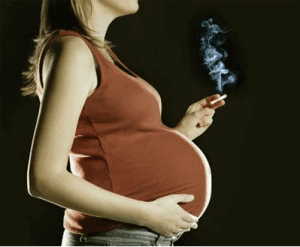 No increase in the incidence of miscarriages was seen in the smokers. The only other prospective epidemiological study was published in 1988 and came to the opposite conclusion. A French group studied 1887 couples who were trying to conceive. When crude conception rates were considered at the end of 1 year, 85% of non-smoking women had conceived compared with 70% of smokers. However when all the confounding variables were included in the analysis, smoking was no longer linked to the occurrence of pregnancy. The authors pointed out that one of the significant differences between this study and the study by Howe et al (1985) was that only 68 women in the present study smoked more than 15 cigarettes per day whereas the study by Howe and co-workers only showed a significant decrease in fertility for women smoking more than this. Retrospective studies are more numerous. In a study performed in 1069 infertile couples and 4305 fertile controls, a significant trend was observed between smoking habit and conception delay. Women smokers showed a risk of delayed conception twice as long as non-smoker women. Baird and Wilcox found that smokers were 3.4 times more likely to take more than a year to conceive than non-smokers. Fertility of women smokers was estimated to be 72% of the fertility of non-smokers and in each cycle smokers had only 67% as much chance of conceiving as non-smokers. Fertility of heavy smokers fell to 57% of that of nonsmokers. Thirty one women who stopped smoking a year before trying to conceive showed no difference in fertility compared with women who had never smoked. Although this is a small sample, this trend is similar to results found in other studies. An analysis of all retrospective studies published showed an overall decreased chance of conception. The chance of pregnancy in smokers in these studies is between 33% and 100% that of non-smokers. Of the nine prospective and retrospective studies that have been published only one, that of De Mouzon et al, has failed to show a negative effect of smoking on fertility.